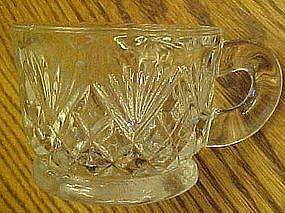 These pretty clear glass punch cups have a nice pattern that would fit nicely with many punch bowls. It has a diamond's and fan's pattern. Cups measure 2 1/4" tall. I have 10 available and price is per cup. All are in excellent condition.